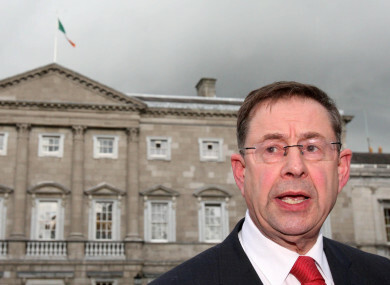 The Galway West TD says he has no regrets about losing his seat on the frontbench. GALWAY WEST TD Éamon Ó Cuív has been making waves in the Fianna Fáil party this year. His name somehow was floated as a possible presidential candidate, much to the displeasure of Fianna Fáil HQ as it had already firmly backed the incumbent Michael D Higgins. And then there was a launch of a purported Fianna Fail candidate in the Northern Ireland local elections, which he led. There was a snag though. Nobody had told the party leader Micheál Martin he was doing so. His reward was a sacking from the frontbench. In an interview with TheJournal.ie, Ó Cuív said he knew exactly what he was doing and he makes no apologies for it. “I have no complaint, I knew what I did, I pushed the boat out, I take it on the chin, no one has heard me complain about it, not being on the frontbench, and I will just continue to work” he said. Utter confusion reigned in November when Sorcha McAnespy, a member of the Fianna Fáil’s national executive, was announced as an ‘official’ candidate in the local elections in Northern Ireland. Standing next to her during the launch event were her two campaign directors – veteran Fianna Fáil TD Ó Cuív, as well as Kerry-based Senator Mark Daly. It was all smiles up in Tyrone. But the celebrations were short-lived. Fianna Fáil HQ was not happy at all. A tweet issued from the party’s main account said it had made no decision to run McAnespy. So it was no surprise when Martin took decisive action and sacked the two politicians from certain roles. Martin moved on Daly first, stripping him of his role as the party’s deputy leader in the Seanad and taking away his portfolio as Seanad spokesperson for Foreign Affairs, Diaspora and Brexit. All eyes were then on Ó Cuív – the former minister whose family history is steeped in Fianna Fáil. Would Martin take action against him? During his meeting with Martin, it was suggested to Ó Cuív by the party leader that he was tricked into the whole affair in Derry, but the Galway TD made it clear to his leader that he knew exactly what he was doing at that ‘launch’ on the night of 25 October. So was this a thinly-veiled attempt to undermine Martin? Sitting down with this publication, Ó Cuív explains why he did what he did. “The reality is I did go to a launch. I think one has to see this in the wider context,” he said, explaining that he has been involved in Northern Ireland relations since 1989 and pointing out that Fianna Fáil promised it would run candidates in the Northern Ireland local elections. I don’t know what the holdup is. It was promised for 2019 for the local elections – we keep getting told it is going to happen. I hope it happens and if I gave it a little push to try and force the issue and if I lost my place on the front bench as a consequence, I am happy to take the punishment… because I think the greater good was served by highlighting we weren’t moving forward with this issue and there are candidates that want to stand for Fianna Fáil. He said one of the great tragedies of the last two years is there is no Executive in Northern Ireland. I think it is absolutely urgent that there is a Republican alternative put up to Sinn Féin in the North that would make it absolutely clear that it would take its seats in the Executive and work for change from within rather than standing outside. I believe there are many many people in Northern Ireland that would vote for such a party — I think it should be Fianna Fáil. Ó Cuív said his party needs to get a move on and organise candidates by the end of January if it is realistically going to run in the May elections. In the background there has been talk of Fianna Fáil moving into the North, but with SDLP candidates. Talks with the SDLP about a possible merger are said to be at a very advanced level, with a possible announcement about a deal expected in the new year. However, some members within the party were happy to state that while it is a leader’s prerogative to lead, it is not their prerogative to “drag” the party down a road of merging with another party – a party which some Fianna Fáilers dubbed a “damaged brand”. It is understood that while running candidates in the North was discussed at the Ard Fhéis, a merger with the SDLP was not. This is an issue of major concern to some within the party. “My information is there is a large number of SDLP councillors and pubic reps, MLAS, that are anxious just to join Fianna Fáil, unconditionally, because the SDLP, they would see as on its last legs. But as seen in other cases, and I don’t want to mention names, there are people that I know of, some of them elected, who would be very anxious to support Fianna Fáil and to stand for Fianna Fáil – some of them might have been in Sinn Fein, some were in Sinn Féin, some were independent, some were Republican candidates,” said Ó Cuív. What does he make of a merger with the SDLP? “A merger with the SDLP as party, there are no provisions in the rules of Fianna Fáil for that, that would require an Ard Fhéis. That would be a huge break from the grounds on which Fianna Fáil was founded. “On the other hand if Fianna Fáil were to say we are going to contest in the North and anyone who wants to joint us, including members who had been in the SDLP or are, on the condition of them leaving the SDLP, independents or Sinn Féin or anyone else who would like to join, our door is open, that would not provide any logistical issue,” he said, adding that Fianna Fáil has always accepted people who were members of other parties previously. However, Ó Cuív questions whether SDLP candidates are a right fit for the party, stating that in his opinion, Fianna Fáil is a “very broad” party which is not confined to any class or area. “I would see in more recent times the profile of SDLP doesn’t fit that, and while there are magnificent people in the SDLP, I believe our engagement with the North should be on a purely Fianna Fáil basis, welcoming any one who wants to join us,” he said. Ó Cuív is anxious for the party to get moving. “Time is running very short… I believe we should run candidates right across the North. There is a vacuum there now, I think someone should fill that vacuum, Sinn Féin are refusing to fill that vacuum so I think someone needs to challenge it from a Republican perspective,” he added. However, there are other issues that occupy the Galway TD’s thoughts. Housing being one of them. He questions why Fianna Fail signed up for another 12 months of the confidence and supply deal with Fine Gael, particularly due to the lack of progress on the housing issue, which he said was well flagged as being a problem as far back as 2010. “One would think in 2013 that there would now be a lot of State sponsored affordable houses and social houses by now – but we’ve got neither… this attitude of the State not stepping in, I think is wrong,” he said. Dubbing Fine Gael a “right-wing” party, he said he does not believe they are compatible with Fianna Fáil after the next election. Will Ó Cuív throw his hat in the ring the next time around? Yes is the short answer. “When I don’t have that energy I’ll pack it up, but as long as I think I can outwork and outlast any of them, I’m in the game,” he said. In order for his ideal to be reached – for Fianna Fail to return as the largest party – he said his party will have to shake things up. Fine Gael and Fianna Fail have agreed that election will be in 2020, but one thing is for sure, Ó Cuív wants an election sooner rather than later. Email “Ó Cuív on that 'rogue' NI candidate launch: 'I knew what I was doing. I'm happy to take the punishment. I did it for the greater good'”. Feedback on “Ó Cuív on that 'rogue' NI candidate launch: 'I knew what I was doing. I'm happy to take the punishment. I did it for the greater good'”.